Our Hand Repair Soap Six Pack Gift Set includes six full size bars wrapped in colorful cigar bands and stacked inside a tall Cellophane Bag, including Mountain Herb, Jasmine, Lavender, Green Tea, Bay Rum, and White Spice. A beautiful gift anytime of the year. Olive, Coconut, Palm and Castor Oils, Sodium Hydroxide or Lye, Mountain Spring Water and/or Goat Milk, Shea and/or Cocoa Butter, ground botanicals, and scent by Natural Essential Oil or artificial fragrances. 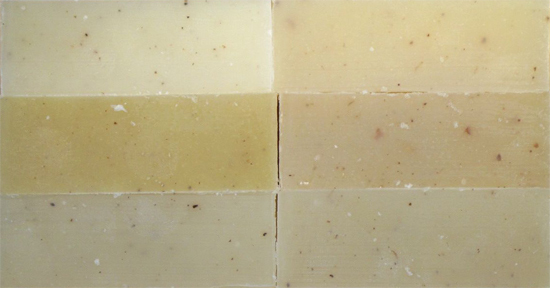 Complete, specific ingredient information is on each individual soap's paper cigar band.